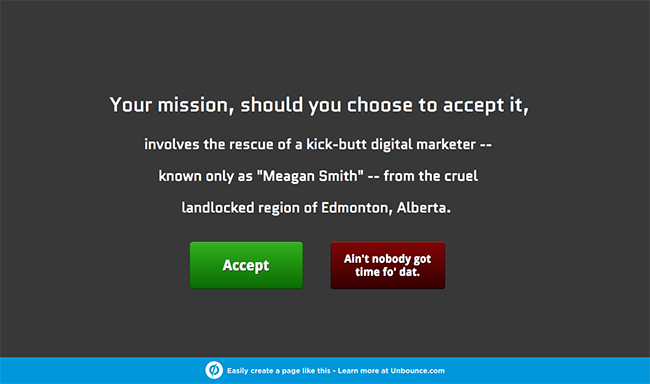 The winner would be sent to Unbounce’s Call To Action Conference in Vancouver this September 13th – 15th. The grand prize was a trip to Vancouver: including the flight, hotel and two conference tickets. The whole shebang! Indeed, it was. But the tribe has spoken. In this post we’ll recognize the winners, their pages, their chops — along with some insights from the judges. We hope you’ll be as inspired as we were. 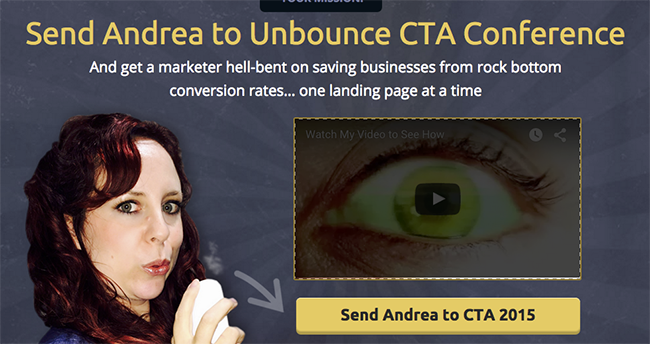 Click on the image to see Andrea’s landing page in all its glory. Mission possible! Andrea’s spy-themed landing page has it all. On top of an action movie trailer that grabs your attention right off the bat, Andrea’s page has a strong headline, clever call to action and strong testimonials to really seal the deal. We’re putting a ton of effort into this year’s Call to Action Conference, but Andrea looks like she’s putting even more effort into attending! 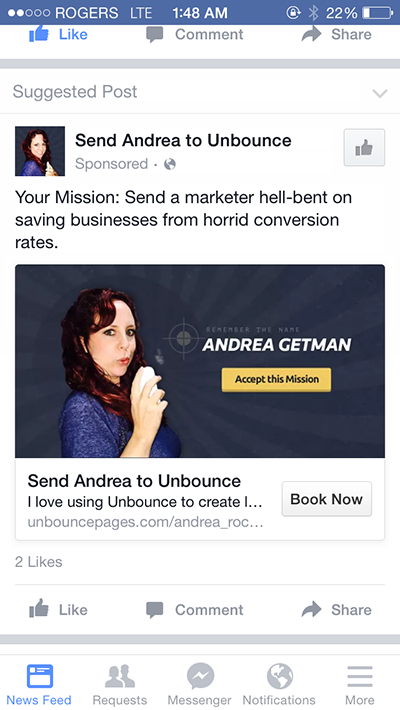 Loved her page, video, testimonials and retargeting (she Facebook stalked me for days…). Knowing how much work goes into launching even a simple marketing campaign, I can appreciate the effort Andrea put into her submission. She managed to stay clear about her goal while mixing in some personality. Driving paid social to the landing page was a nice little touch! There’s more, too. As a landing page optimization veteran, Andrea also conducted an A/B test to see if more explicit directional cues would result in a conversion lift. See that little arrow pointing to the CTA button? That’s a directional cue if we ever saw one. The variant with the directional cues resulted in a 5.2% conversion lift over her original page without them. Boss. 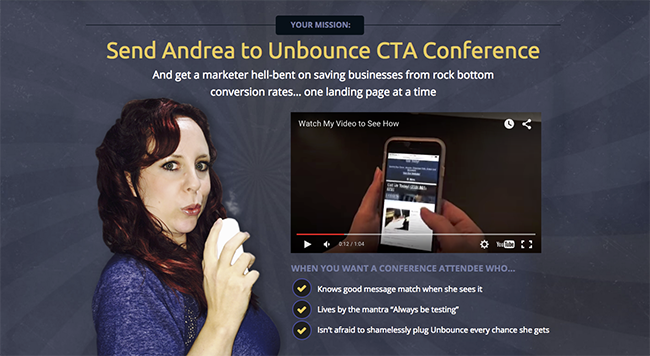 Congrats Andrea, you’re coming to the Call To Action Conference! Do you remember that acne commercial? I used to imitate it all the time. His video was perfect. The judges also loved how he used an attention-grabbing picture of himself as a directional cue that focuses the eye on the call to action button. 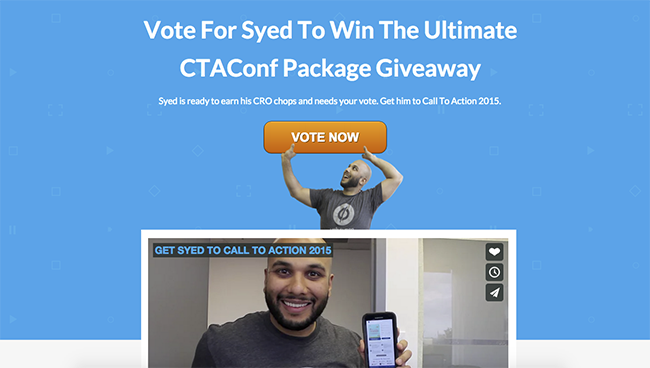 Syed’s landing page is pure humor. With little images of himself pointing to every call to action, he makes himself the directional cue and makes the CTA hard to avoid. 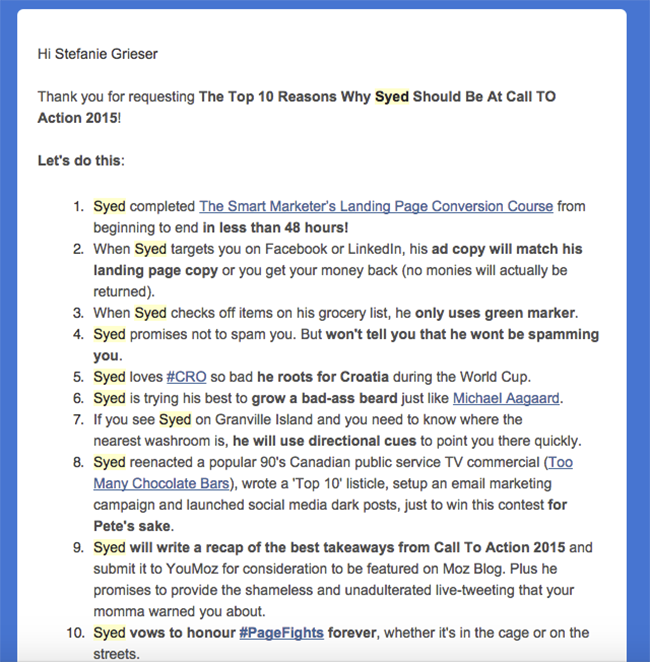 Syed was another clever contest who retargeted us on Facebook – but he took things a step further by including additional incentive to fill out the lead gen form. But it wasn’t all just fun and games – his landing page did its job by converting at a healthy 16.96%. Congrats Syed! 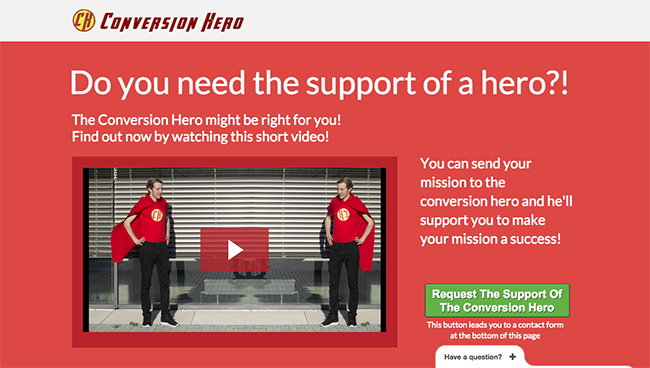 Click on the image to see Thomas’ landing page and watch a true conversion hero. I really like the way Thomas directed his pitch to you. He really kept people engaged and answered the question: what’s in it for Unbounce to have him at the conference versus why it’s good for him. #winner! Thomas employs a bunch of neat persuasion tactics like urgency/scarcity, social proof and directional cues. It’s clear that Thomas knows his conversion stuff and would add as much to CTA Conf as he’ll get out of it. Indeed, Dan. We can’t wait to meet you, Thomas! Part of the reason choosing a winner was so difficult was that we had so many awesome submissions. We would be remiss to not highlight some of the other beautiful landing pages and creative ideas. 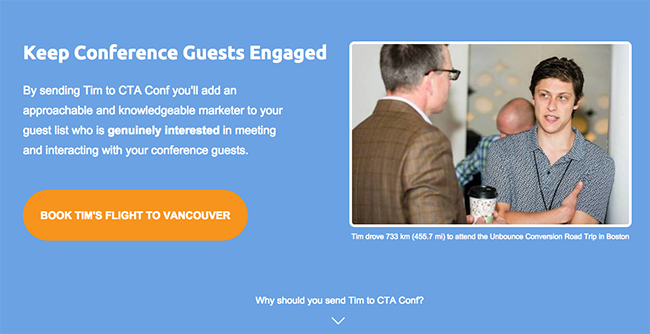 Click the image to see Tim’s entire landing page. Tim’s call to action went right to Google flights, searching Buffalo to Vancouver. Very clever. 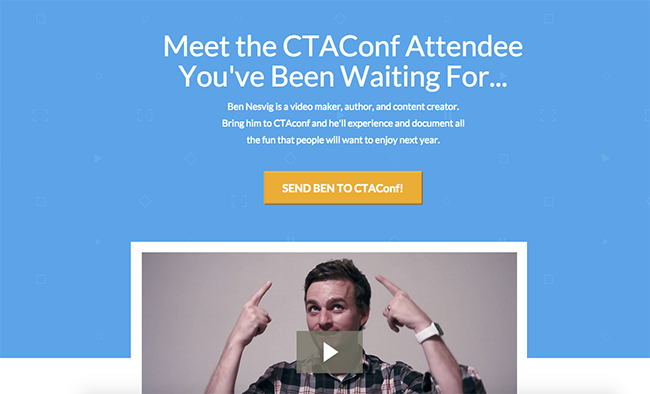 Check out Bethany’s landing page and you’ll want to go to CTA Conf too. Click the image and check out Ben’s landing page in full. 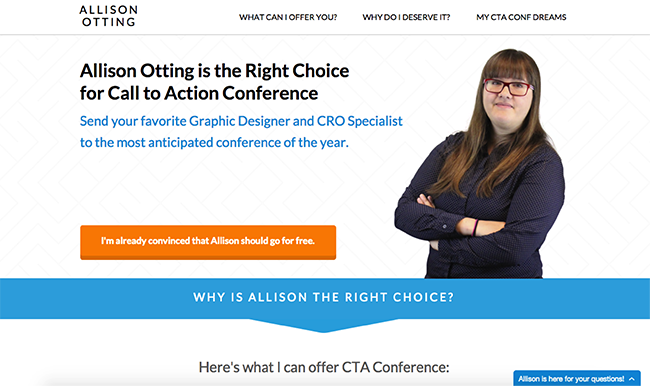 Click the image to check out Allison’s awesome landing page. Click the image to see Clay’s landing page in full. 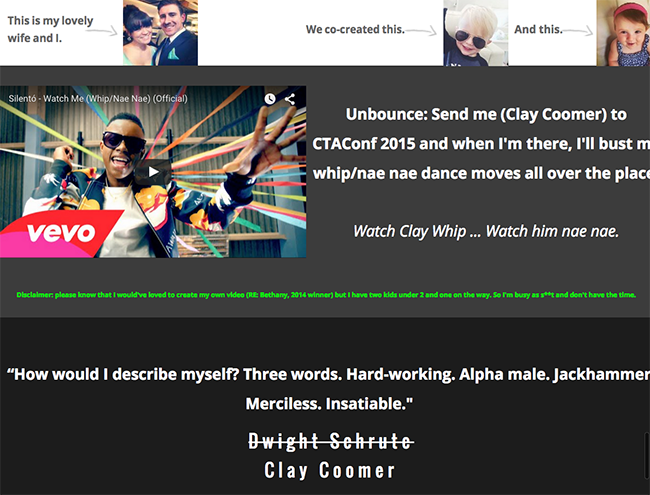 Clay’s landing page included a ton of personality, memes and dancing. And his kids are so cute! We especially loved the “data doesn’t lie” section. Click the image to see Meagan’s landing page. Meagan’s landing page is hilarious and full of personality! If you choose to accept the mission she puts forth, you’ll see what we mean. 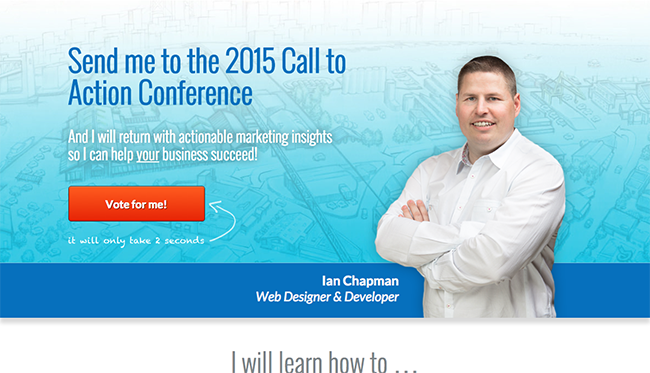 Click the image to see Ian’s landing page in its full glory. Ian’s landing page is well-rounded and persuasive, and if you skip down to his “About me” section, you’ll see a pretty adorable testimonial from his wife. Priceless. See you at the Call to Action Conference! Cheers to a seriously badass group of landing page builders – we were blown away by your expertise and creativity. And congrats to our top three winners: Andrea, Syed and Thomas. 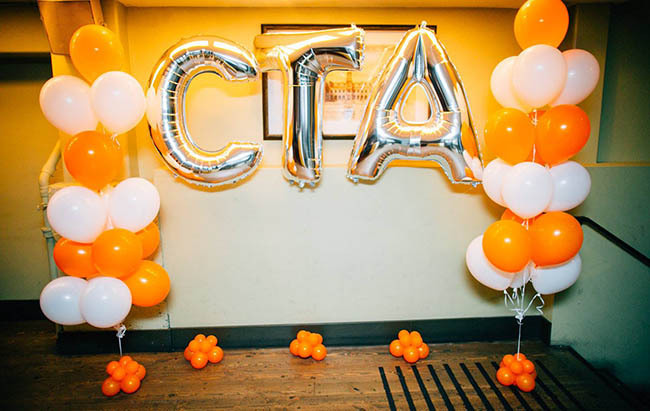 We can’t wait to spoil y’all with knowledge, food, beer, adventure and Unbounce hugs. Congratulations! We hope to see you all at the Call to Action Conference from September 13th – 15th.